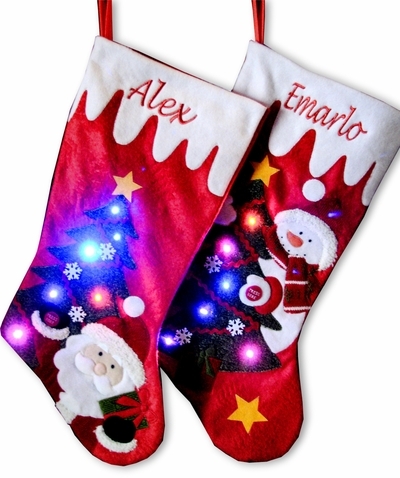 This is the stocking of the stockings - it features mini LED lights which light up when you push a button. The light up stocking is a gift on it's own. The kids as well as adults will be happy to play with the stocking - who cares about the stuffers when the stocking is so cool! There is a button you push, (Press Here) and the mini LED light light up on a Christmas tree for about 20 or so seconds blinking in a random order. Then they automatically turn off so you do not wear out the battery. The stocking is powered by replaceable batteries available in any store (aka watch batteries) so it will decorate your mantel for years to come. Measured Diagonally from the top left hand corner to the toe, the stocking measures 21.5 inches, and the width along the cuff is 9 inches. This is a large personalized Christmas stocking that is plenty wide to fit lots of presents. Materials: Base is soft high quality felt with exterior covered with chenille knits, metallic fabrics, fleece patches and fabric decorations on the stocking body the Christmas tree applique decorated with real LED Holiday lights that light up.